The Taj Mahal has come to Atlanta—as one of the huge lantern designs presented in Turner Field by a Chinese company. 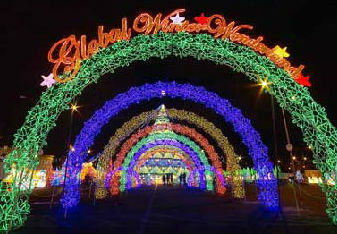 Global Winter Wonderland (GWW) threw open its gates to the public on November 21, 2013 and will remain open until January 5, 2014. Billed as the largest multicultural lantern festival outside China, it is not only entertaining but also educational and inspiring. Carla Smith, Atlanta City Council member, speaks at ribbon-cutting ceremony. The ribbon-cutting ceremony was opened by John Lin, of IGO Group, Inc., the presenter of Global Winter Wonderland. He explained that GWW made its US debut in 2011 in Santa Clara, California and has now appropriately come to the home of the 1996 Summer Olympics. The Atlanta Braves are also a partner in the venture, and Mike Plant, Braves EVP of Business Operations, welcomed all to Atlanta’s much loved Turner Field. After the ribbon-cutting ceremony, visitors took a stroll in the theme park to admire the larger-than-life lantern designs of landmarks such as the iconic Statue of Liberty, imposing and majestic White House, Syd¬ney Opera House, Taj Mahal, Eiffel Tower, Chichen Itza, London’s Big Ben, the Golden Gate Bridge, Mount Rush¬more, M.L.K. Monument, Great Pyramid of Giza, the Great Sphinx, etc. 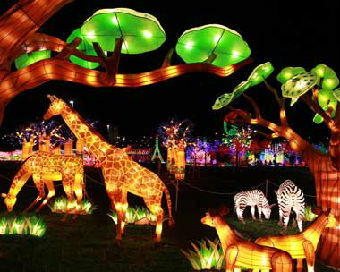 The theme park has an international garden, dinosaurs, wild life, huge drag¬on lantern, and more, spread over 16 acres of land. There are rides, fun activ¬ities for children, international cuisine, and live entertainment from local, re¬gional, and international performers, including the UniverSoul Circus. Visit www.Globalwonderland.com for infor¬mation on visiting this unforgettable event in Atlanta.